I’m not super into making my own activewear. Good patterns seem to be few and far between, not to mention the trouble sourcing appropriate fabric and home sewing machine’s limited capabilities of producing quality, professional finishes… Mostly, I don’t find it worth the effort. However, I had been looking for a long sleeve top and just couldn’t find what I wanted. 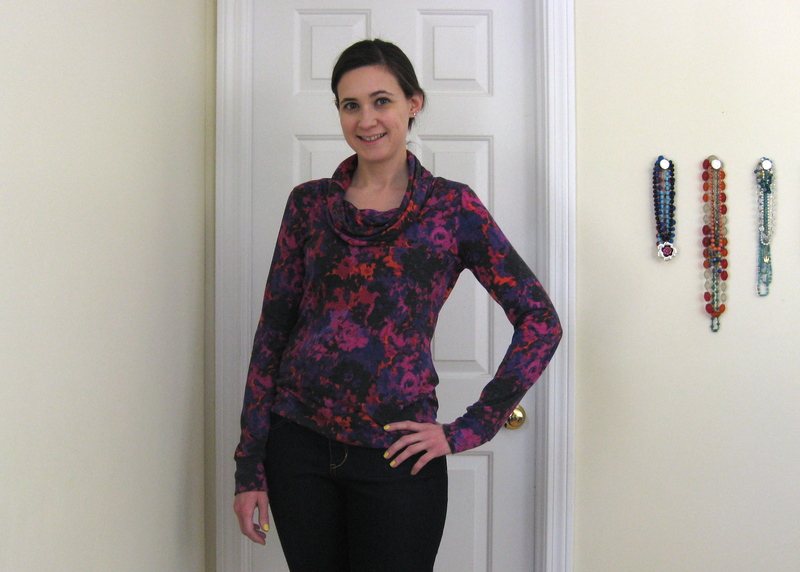 I wanted a simple non-hooded, non-funnel neck top with sleeves that are actually long enough for my monkey arms. 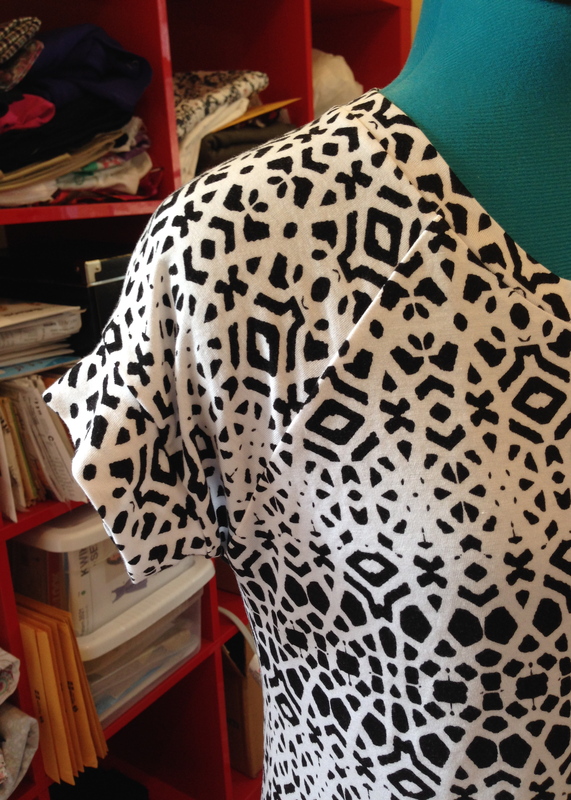 I ordered some dri-fit knit fabric from Koshtex and decided to sew up the Lane Raglan by Hey June. A while back she added a few features to the basic tee, and now you also get pattern pieces for a hood and deep cuffs with thumb holes. I didn’t need the hood for this top, but the cuffs with thumb holes? YES. Instead of using body measurements for choosing a pattern size, she has the finished measurements listed so you can choose the amount of ease according to what fabric you are using. My current measurements are about 34″-28″- 39″ so I picked the size S, grading out to a L at the hip. It ended up being a bit larger than I wanted, so I trimmed down the sleeve and side seams by 1/4″ (removing 1/2″ from the sleeves and 1″ from the body in total), but left the hip at the original width. Instead of the regular neck band, I did a narrow bound edge. I really like this finish, and it ends up being a little smoother on the inside, which is important for activewear. Also, instead of a hem band, I lengthened the CF by 2 1/2″, and the CB by 3″ to create a curved hem. I prefer my running tops to be nice and long, and I have a thing for curved hemlines. I usually have to lengthen sleeves, but these were perfect as is. In fact, I had originally added 1/2″, but it was too much and I had to go back and remove the cuffs and cut off the extra sleeve length. The thumb hole cuffs are just fantastic for running. Now that it’s getting quite chilly in the mornings, I wear a fleecy pullover but, natch, the sleeves are too short. These cuffs help tremendously in keeping out the chill. I think if I make another running top from this pattern, I will add a CB seam to help remove the excess fabric that pools at my lower back. It’s not a big deal, and frankly it looks worse just standing there in photos than when I’m moving around, but I’d really prefer a slimmer cut. 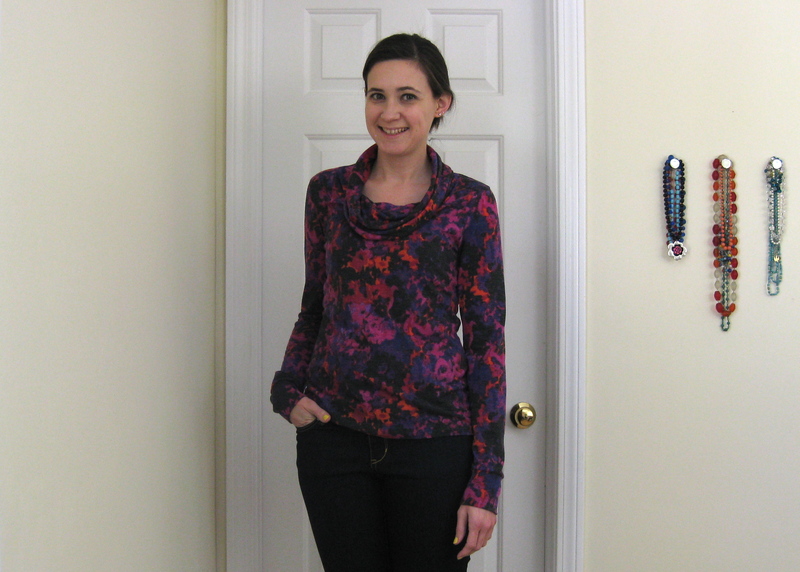 Now I did try the Fehr Trade Surf to Summit Top last winter, which has princess seaming for shaping, but in the end I just didn’t enjoy wearing the top; the fit was slightly off and the raised neckline was very uncomfortable. I can usually make alterations to get things to work, but raglan seaming throws me! All in all, this is a successful top, and the fabric is great! I’ll definitely be ordering from them in the future—the prices are very reasonable and the shipping was super fast. I placed my order on a Friday afternoon and it was on my doorstep by the following Monday. Love that! this is another knit fabric from joanns. i’ve come to the conclusion that i will buy a quality knit fabric anywhere i can find it. the thing i hate about online shopping is that often you have to buy in whole yard increments, which drives me nuts for tee shirt making. usually i need just more than a yard to account for shrinkage/hem bands/pattern matching/etc, so i end up with these odd bits leftover that are useless. anyways, i’ve never had an issue with joann’s knit fabrics, but this one was terribly off-grain in one section. 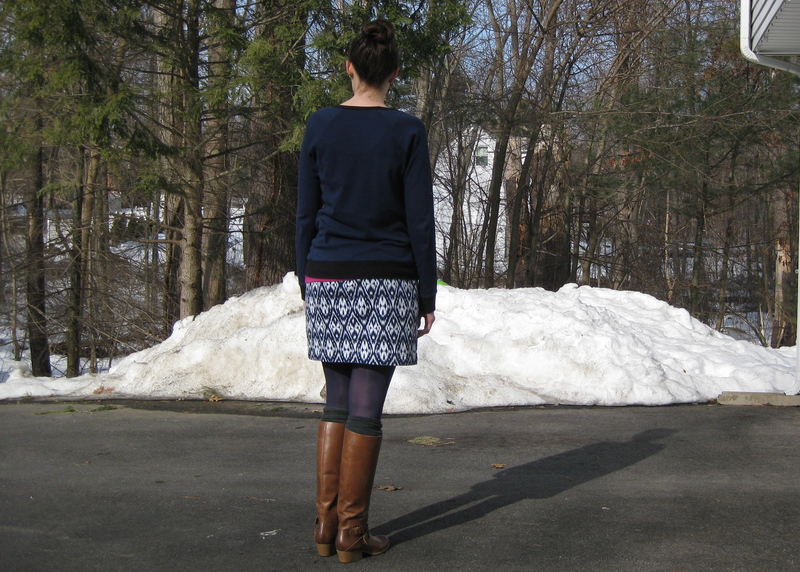 it was so bad that i wasn’t sure i’d be able to use it for anything other than maybe a gathered skirt. however, with some fancy layouts, i managed to get the front and back cut mostly on-grain. i had to fudge a bit with the sleeves, but i think it all worked out fine! i cut the same size as before, except that i shaped the sides and hemline differently. i left the bust area alone, then flared out a bit and added some length. the pattern allows for a hem band, so i added that length plus an inch or two in the front, and two or three in the back. i gave the hem a slight curve so it wouldn’t completely cut me off at the hip. i went with short sleeves with a 1.5″ wide hem band. i used to think that raglan tees look funny with short sleeves, but i’ve come to like them finished as i did here. in other news, i finally tried knitting! yeah, it’s april… but i’ll need a bit… okay A LOT of practice before i want to tackle the knitted things i really want to make. initially i started off doing just the knit stitch for each row (which gives you the bumpy rows) but after about three hours of that i was bored off my patootie. i turned to google to search out easy knitted scarf patterns and found this post. being able to switch between knitting and stockinette made things slightly more enjoyable, plus it created a fun pattern. so i’m not gonna say that i’m totally in love with knitting, but i am hoping to add it to my skill set. the hardest part was adjusting to the slow pace, even on something like this that knits up rather quickly—just a few evenings in front of the tv. the whole world of knitting and following patterns and learning the language is still a bit of a mystery, but i’d like to make a spring weight infinity scarf. any pattern/yarn suggestions for a newbie? guys, i don’t know if you’ve heard, but it’s been a flipping long and cold winter here in the northeast US. this is the winter that will not for the love of all that is holy end! since winter is refusing to leave, i made two tops to help keep me toasty warm—a raglan sweatshirt and a cowl neck renfrew. the only change i made was to cut the cowl neck as one piece that gets folded in half. i just don’t see the need to have two separate pieces. also, i lengthened the sleeves by making an extra wide cuff, and lengthened the body to omit the hem band. i like the hem band finish, just not for everything. for the sweatshirt, i used the lane raglan tee put out recently by hey june of crafterhours. i’ve been wanting a raglan pattern, and this one fit the bill. 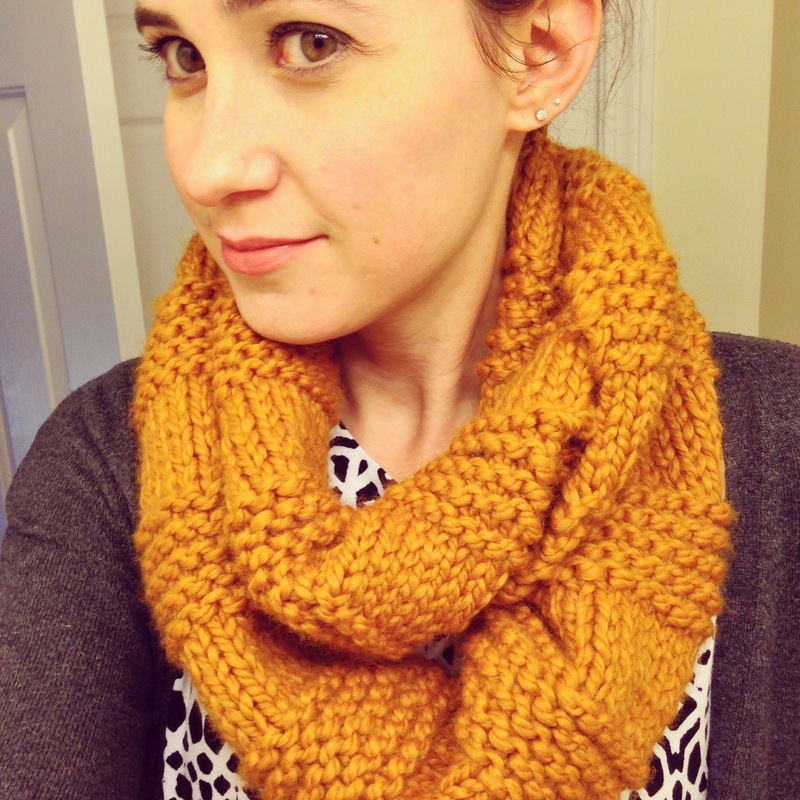 i used one of those cotton interlock knits that have nice stretch, but not so much recovery. i haven’t found that type of fabric terribly useful for most projectes, but for this sweatshirt, it was perfect. the fabric actually came from a box of “too large to throw out” scraps that Gail from Today’s Agenda sent me last summer. i had less than 3/4 yd, which was just enough to eek out this pattern, thanks to the 1/4″ SA’s. then i used contrast ribbing for the neckline and sleeve/hem bands, and even added the little triangle patch for good measure. this i also have been wearing non-stop due to the afore mentioned cold weather. miracle of miracles… today is a “warm” (mid-40s F) day! outdoor pics!! no color editing!!! i happen to really love navy and black together, but i wasn’t so sure if it would look okay paired in the same top. i went for it anyways, and i’m glad i did! i love the monochrome look with this outfit (my skirt, natch, is a moss mini), and the black ribbing sets it off nicely. i wanted this sweatshirt to be a little oversized, so i didn’t pay a ton of attention to the fit. when i make it up in a regular jersey, i’ll have to compare it to my renfrew, since this type of fabric is terrible for gauging size. here i cut the small, and the size chart only gives the waist finished measurement. the small has a 33.5″ finished measurement size, and to be honest i was a little thrown for a loop when deciding which one to choose (my actual waist measure is 29″-ish). but like i said, for this sweatshirt i really just wanted a slouchy comfy top! given that the cold weather tends to overstay it’s welcome in this part of the universe, i should really make a handful more of each of these. maybe in spring colors so i can pretend it’s not still cold? yeah, that sounds good.